We wandered down to the promenade through clammy sea fret. On either side of the road stretching as far as the eye was a congested mass of people and glittering Harley Davidson motorbikes—two thousand of them somebody said—Hell’s Angels with wrap around shades, black helmets and filthy leathers astride elegant monsters in chrome and polished metal, lady-riders in white leathers fringed with tassles, old enthusiasts with kids riding pillion, riders in peaked US police helmets sitting nonchalantly upright on bikes as wide as cars, contingents from Germany, Holland, USA, the usual crowds of hangers-on riding Japanese bikes and mopeds . . . . There were a few wartime models, each painted in drab khaki with a single white star across the petrol tank, a leather rifle holster on the front forks, the riders in US army helmet, khaki one-piece suit and boots. For most of the day they’ve been roaring around Watermouth in big groups, turning heads. 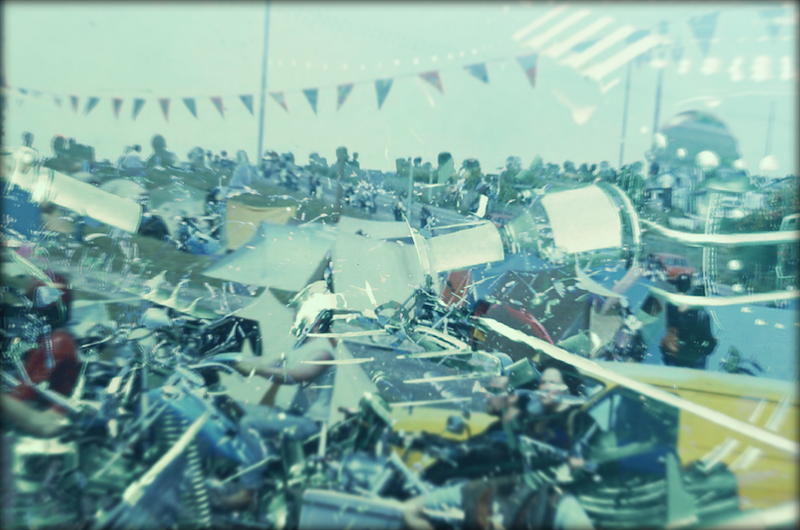 We were in the Pembroke playing pool at dinnertime when the roar and thunder of several hundred thousand c-c’s sent everyone—landlord and all—rushing to the door to watch the seemingly endless stream cruise past, engines snarling, the air full of blue smoke. . ..